Using a hand-held mixer, beat the cookie crumbs and cream cheese together until well combined. Roll the mixture into balls. Form those balls into tall triangles; the shape of a hat. Chill the triangle balls, covered tightly, for an hour in the fridge OR place in the freezer for 20 minutes. Place the triangle OREO Cookie truffle on a fork and then spoon the melted chocolate evenly over the ball. Tap the fork holding the truffle to remove excess chocolate. 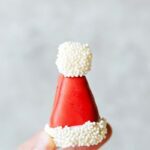 Slide the truffle carefully onto parchment paper and immediately (it hardens quickly) press the miniature marshmallow on top of the hat. Allow the truffle to harden completely. Once hardened, melt the white chocolate in bursts of 15 seconds, stirring in between each burst for 15 seconds until completely melted. Dip just the marshmallow into the melted chocolate (just barely coat) and then dip in a bowl of the white sprinkles. Shake off the excess. Repeat for the base -- dip in melted white chocolate (or spoon it on) and then dip in the bowl of sprinkles. Allow to set up at room temperature.